Each fall, the skies above Canada and the northern United States become flooded with birds. The 3 to 5 billion birds that emerge out of the boreal forest after summer breeding season once again take flight, this time headed toward their favored wintering grounds. More than 1 billion are headed directly for the United States, ranging from waterfowl, sparrows, finches, waxwings, warblers, sandpipers, cranes, hawks, and eagles, among others. Many more species will pass through or around the United States in favor of warmer destinations. Numerous shorebird species find solace around the shores and waterways of Central America, the Caribbean, and South America, while many of the boreal forest's vast collection of warblers and other songbirds find inland habitat throughout Central America and northern South America. Some birds, including Lesser Yellowlegs, Blackpoll Warbler, and Solitary Sandpiper, become common wintering species in the Amazon rainforest and provide a direct, tangible link between these two sister forests. The United States is far and away the most popular winter destination for the billions of birds that breed each year in the boreal forest. 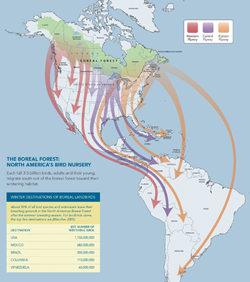 However, Mexico, Brazil, and a variety of other countries throughout the Americas receive sizeable populations of boreal-breeding birds each winter. Some of the longest annual migrations on Earth involve boreal birds. The Hudsonian Godwit, for example, commonly breeds in the Mackenzie Delta and Hudson Bay Lowlands of northern Canada before migrating all the way down to the southern tip of South America. The Arctic Tern breeds in the far northern North American Boreal and Arctic regions before flying all the way down to the coastlines of Antarctica. The Arctic Tern (50% of which breed in the boreal) has one of the longest migrations on Earth, breeding in the far northern pockets of North America before migrating all the way down to Antarctica.